January 31, 2013 / P.J. If you’re like most disc golf junkies, you probably want to play more than you do. But life — work, family, inclement weather, whatever — gets in the way and keeps you off the course and indoors. Have no fear. 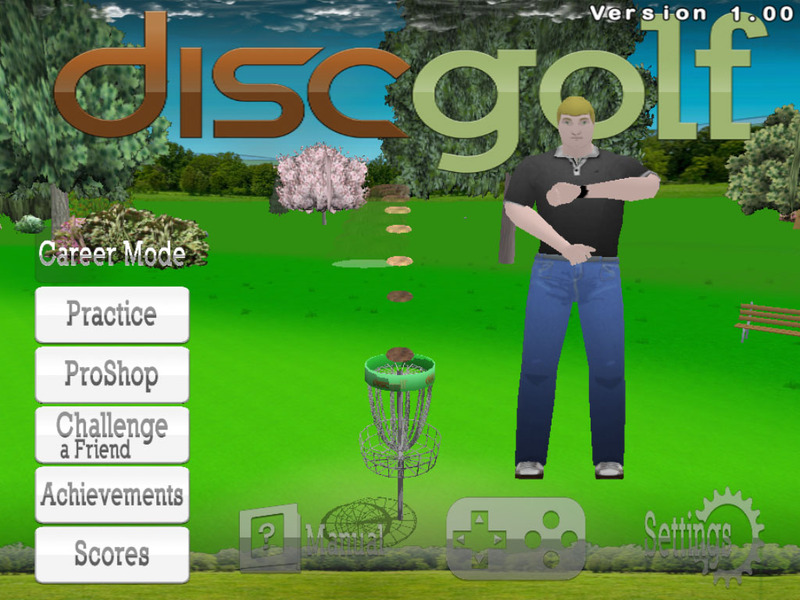 Disc Golf 3D is here. Nuclear Nova’s newest game — Disc Golf 3D. Recently released by software company Nuclear Nova, Disc Golf 3D is available for download for Apple platforms and, for this disc golf junkie, was easy to get hooked on. I had the luxury of enjoying the game on an iPad 2. I eased into the fray by testing out the game’s practice mode, where I was presented with a selection of discs from which to choose. Using familiar speed-glide-stability ratings, I was able to play with animal-named plastic like Antelope (driver), Manatee (mid-range) and the aptly-named Sloth (putter). Once on the course, players are treated to a flyover of each hole that serves to show the lay of the land and basket location. While the graphics aren’t flashy, they are serviceable, with trees that shake to emulate wind and varying levels of blue for water. Honestly, though, you won’t be playing this game for how it looks. You’ll be playing for the fun factor. A brief on-screen tutorial then points out how to switch between discs and how to use the game’s drive engine. 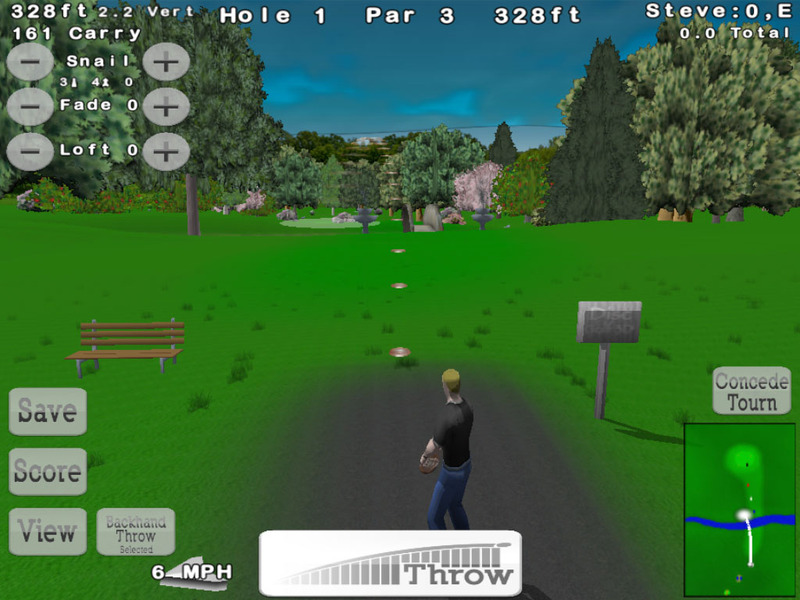 Anyone familiar with video game engines that require both power and accuracy — such as those used in kicking a football or driving a golf ball — should be at home playing Disc Golf 3D, though, as it uses a pinging up-and-down meter for power and back-and-forth meter for location. Hit the sweet spots, and you’ve crushed it. There’s a lot of options on the screen, which makes it easier on an iPad screen. After a couple practice holes, I dove right in to the game’s career mode, where you can really test your virtual disc golfing skills and work up through the ranks from amateur to pro. After each tournament, you earn experience points that you can put toward different facets of your game, thus increasing your skills the more you play. It’s one of the ways this game keeps you coming back. As of now, I have played through roughly 60% of the career mode, and I have been racking up victories left and right. So, unlike regular disc golf (for me), the game isn’t particularly challenging. Much like actual disc golf, the putting on this game is the trickiest part, but I do have a pro tip for new users — when trying to hit any putt, touch the power meter a little higher than the distance it says it is to the hole. This ensures that you don’t low putt and clang off the basket, and more often than not will leave you smashing the chains. As with real disc golf, putting can be the hardest part. This happened to me on two holes in a row recently and cost me about seven strokes in the game. I eventually had to wing it out and away from the basket, then approach and putt again in order to hole out. The only other change to the game I would like to see would be for Nuclear Nova to roll out a greater variety of courses. 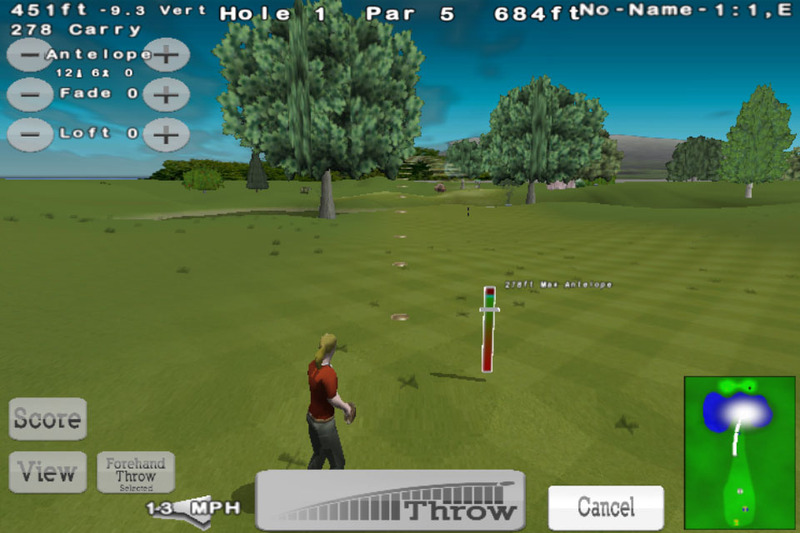 The ones currently on the game are very ball golf-like, with a lot of open distance. I would love to see an update in which some more tight, technical shots are required, a la the wooded courses of North Carolina or the Pacific Northwest. That would take this game to a whole other level of virtual reality. 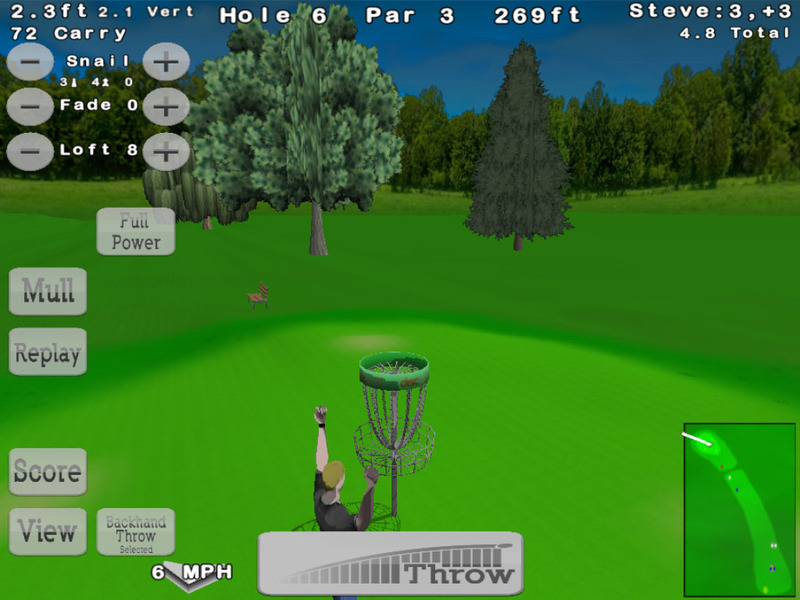 On the whole, though, Disc Golf 3D on the iPad is fun, and highly addictive. At only $1.99 to download, it’s an easy buy for anyone who considers him or herself a fan of disc golf. I’ve never been a true gamer, so I don’t own platforms such as a Playstation 3 that offer the ability to play disc golf in the virtual world. So when one became available for the iPhone, I was interested. First, this game is really quite fun and interesting. If you take a fun approach to the game, there shouldn’t be any issues. But let’s be real — the iPhone (or, for that matter, an iPod) has a small screen. When playing a game like this, it can be frustrating at times. The shot meter is bigger on the iPhone when shooting with a backhand. There is a lot on the screen of an iPhone. The screen captures don’t give you the best look at how scrunched it is on an iPhone screen. The iPad would definitely be a better screen to play the game on and if you use this on a Mac, you’ll have the luxury of having a full screen. The controls are simple enough, but making choices on the smaller screen can be hard. When throwing in a forehand style, the meter bars you need to throw are smaller and harder to see. You can see a slight difference on the screen captures, but imagine it even smaller on a phone screen. When in a traditional backhand, they are bigger and easier to use. That being said, this game can be quite fun. Nuclear Nova has made sure to capture quite a few things that should make any disc golfer happy to play the game. 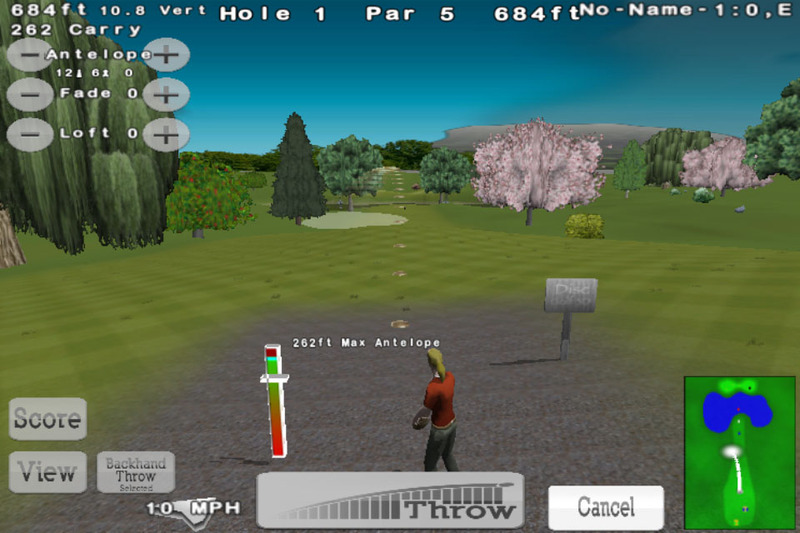 The company has given the game realistic flight patterns, some unique courses, customizable characters, a career mode, multiple pin placements, environmental factors and the ability to purchase custom disc upgrades by using virtual money you’ve earned in the game or through an in-app purchase. The graphics, too, are really top-notch. It takes a little time to get your timing down (and I don’t even have it down yet, but that’s no different than my actual game), but it’s still fun to watch yourself chucking discs in a video game. I haven’t played the career mode as I have basically just played in the practice mode, trying to figure things out. It’s realistic in that until you get things down, things can go wrong. Discs can go off the wrong way, come up short or go long. Putting is, indeed, the toughest part of the game as you can easily miss a two-foot gimme or drain one from 50. I have to admit that I truly like that aspect of the game as it truly sells the reality aspect. And the sound of the disc hitting the chain is pretty sweet. When using the forehand, it’s harder to see the shot meter. I’ve spent a bit of time on the game and it can be addictive. The best part is being able to leave the game and come back to pick up where you left off. Still, it can be hard to play on the iPhone screen, which probably makes me put the game away sooner than if I had it elsewhere. There are things I feel need some work as it is frustrating at times. One thing is the speed of the meter bars. When in beginner mode on practice, the second meter bar goes extremely fast, which made it hard to finish off a short putt or have a really crushing drive. In time, hopefully I’ll get that timing down, but it’s also hard to always see where it is on a smaller screen and high speed. It’s my hope the game will continue to develop and add new things, such as courses, discs and little things to keep the realistic feel of the game going. The price makes it an affordable app to have some fun with. I would definitely encourage disc golfers to check it out as it’s a nice way to get a round in when you can’t hit up the course. Nuclear Nova has also donated a few codes for a contest (below), so you have the chance to win a free copy of the game. Rattling Chains has been given some codes so you can get a copy of the game for free. We have a few that can be used on iOS devices (iPhone, iPad, some iPods etc.) as well as a few that can be used to get the product on any Mac product from the past five years or so. To win, just drop a comment here about why you want to win this app. Let us know what operation system you would like a code for. We’ll have separate drawings sometime Monday and we’ll contact the winners via e-mail. Once you reply back, we’ll send the code over! This game looks awesome! It’ll be perfect when flying back to the east coast while lugging my disc bag as a carry on. On my iPhone of course! Ahhhh, I can finally disc golf while I am at work and at dinner with the in-laws! Hook me up with a code for an iPhone 4! i was one of those folks who at one time swore to never own a smart phone. OK, i gave in to the iPhone 4s about 8 months ago and have never looked back. not only am i addicted to the game of disc golf (thanks to my wife for letting me play as much as i do), but i have since gotten addicted to playing DG games on my iPhone. iDisc Golf Pro and Pocket Putt see me on a daily basis, multiple times per day. Disc Golf 3D? This is one App i must have on my phone. Thank you. Great I buy the app for my Mac and iPhone and now your giving it away! The game is much better on a laptop. It’s plays ok on my iPhone but seems to lag a little between holes. And when the disc lands under the basket it’s impossible to putt it out. With that said it’s a fun game that is one of the better DG games. Hey I’m 16 and I’ve been playing competitively in leagues and tournaments for 4 years now. It would be great to have this app so after I get home from school (junior in high school) I could do what I love to do on the weekends. I saw this on the nwdiscgolfnews.com website and hope for a port to android. I have heard all the fragmentation issues, but the most popular tablet for Google now is the Nexus 7, so just write the game for android 4.x and I will be happy (because it’s all about me ;p),not asking much. Just want to play. I don’t have a disc golf game because the one I have isn’t compatible with 4.2. Please listen to the crys of the Android lovers please!!! The -15 wind chills are keeping me off the real course, but having this app for my iPhone would be a nice compromise until the temps warm back up! I’m a bit selfish with disc golf. My 6 & 8 yr old daughters love to get out and play, but I usually get only 1 day a week to play. Thus, I selfishly play competitively with adults most of the time. This game would be great to keep them interested in DG, and should peak the interest of my 1 yr old daughter as well. Hopefully this is a good way to scratch the itch when it’s -40 outside here in Winnipeg, MB Canada! I’ll try it on my iPhone.